1. The Voortrekker Monument Committee have arranged an Ox-Wagon Post which will carry special commemorative envelopes issued by the Committee. These will receive special cancellation marks at certain historic spots en route and again on arrival at Pretoria in the Centenary Post Office at the Monument. (near Cradock; the site of the culminating scene of an armed struggle between British and Dutch in 1816 - events which led up ultimately to the start of the Great Trek in 1836) on 28th September. 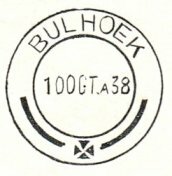 Bulhoek, the reputed birth place of President Kruger is reached on 11th October. Continuing onwards via Bloemfontein and Kroonstad it reaches Vegkop (where the Trekkers had their first encounter with the Matabele) on 2nd November. The route is then via Potchefstroom, the first capital of the Transvaal, Zeerust, Rustenburg, Johannesburg and Pretoria. The total distance travelled will be 1,705 miles, the time taken being four months and seven days. 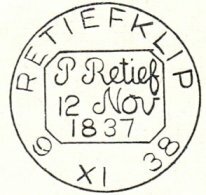 There are no restrictions as to the amount of stamps put on the covers, so long as there is sufficient to cover postage to the address given. (about 9 x 6 inches) to take these comfortably. 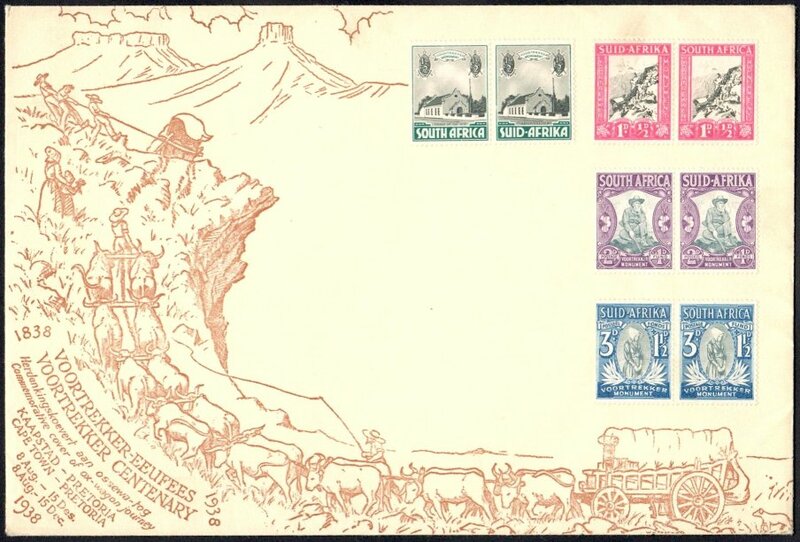 The envelopes, designed by Mr. W. H. Coetzer, show Voortrekkers and a Wagon climbing the side of a kopje and it should be emphasized that only these special souvenir covers will be carried by the wagon-post. No 43 Anglo-African Buildings, Joubert Street, Johannesburg. 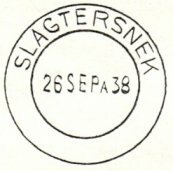 There is no doubt that many people, other than ordinary stamp collectors, will be keen to have a historic memento of this kind and will not object to paying their 6d for an envelope and 1s 8d for a set of Voortrekker stamps (of which 7d goes to the Memorial fund). 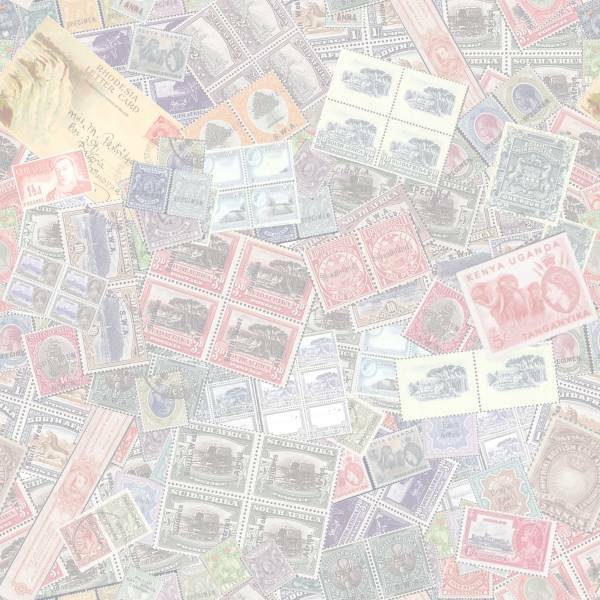 In the circumstances it is a pity that the distributing committee called attention to the possible investment value of the covers; it rather vulgarises what otherwise would have been simply a philatelic souvenir of a most interesting historic occasion. The present set is to be withdrawn from sale on 30th September, and to be demonetized on 31st December, 1938. On 15th December a special centenary set will be issued. 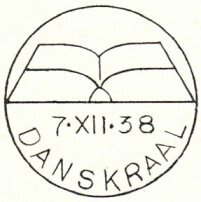 There will be ½d + ½d, 1d +1d, 1½d + 1½d, and 3d + 3d alternately in English and Afrikaans on the sheets. Total face value for the eight stamps, 2s per set. Initially only the above Envelopes were meant to be carried, but that stringent rule was waivered, yet any other envelope carried on the journey is effectively rare. The following account I found on part of an old Photocopy in a collection. I have no idea who wrote it, when and where it was published - written in Afrikaans, I have translated the content. Note the weight of mail has been estimated by me after establishing that ten Voortrekker covers weigh 180 - 200 grams. Mr M.C. Van Schoor, fondly known as Oom Tienie, was appointed as a Special Trek-Postmaster to oversee arrangements and to ensure that all ox-wagon mail was conveyed as smoothly as possible. It did not take long before the Trek Post was to encounter its first problem. On 8 August 1938 the ox wagons Piet Retief and Andries Pretorious departed from Cape Town with approximately half a ton of mail and by the time they reached Worcester another 100+ kilos had been added to their load. On arrival Worcester the mail had to be unloaded as the base planks and wheels of the wagons were already beginning to sag. Van Schoor had personally assured Dr E.G. Jansen, the Chairman of the Voortrekker Centenary Committee, that all mail would be transported to Pretoria and Blood River by ox wagon. To solve his immediate problem, Oom Tienie and the Worcester postmaster, Mr Heard, stowed the mail at his office and sent the ox wagons back onto their route. In the meantime a new and larger wagon, Hendrik Potgieter, was built, donated and completed by Coach Builder Philips of Paarl in less than two weeks. Rumours were already circulating that Van Schoor had dispatched 31,541 covers by rail to Pretoria and the media confronted him at Swellendam. He assured his doubters that all the mail was strictly under his control. Thus while the main body of the Trek was at Heidelburg, the new wagon was sent by train and unloaded at Ashton Station. That same night the post held at Worcester was dispatched per mule cart to Ashton to rendezvous with the new wagon. Using five spans of oxen, held at strategic points, the Hendrik Potgieter caught up with the main trek carrying the all important mail. Thus part of the ox-wagon mail was in fact also transported by a mule wagon. Despite the Post Office ruling that the ox wagons were to only convey Official Commemorative Covers. Ordinary mail matter also found its way onto this historic Trek. Envelopes originating from South West Africa were at first prohibited and that rule was also withdrawn. 6739 Covers with S.W.A. overprints were loaded onto an ox-wagon at Bloemfontein. Almost 7000 covers is a fairly large number, yet I do not recall seeing such an item - Some years ago I acquired the late Mr Leddington SWA collection which included a huge range of covers, but not one connected to the 1938 re-enactment of the Great Trek. 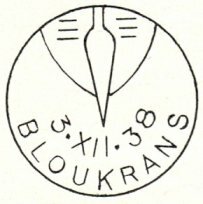 At the 1938 Philatelic Congress of Great Britain, commemoratives once again received a bad press and they deplored the issues of Spain, along with those of France and its Colonies. 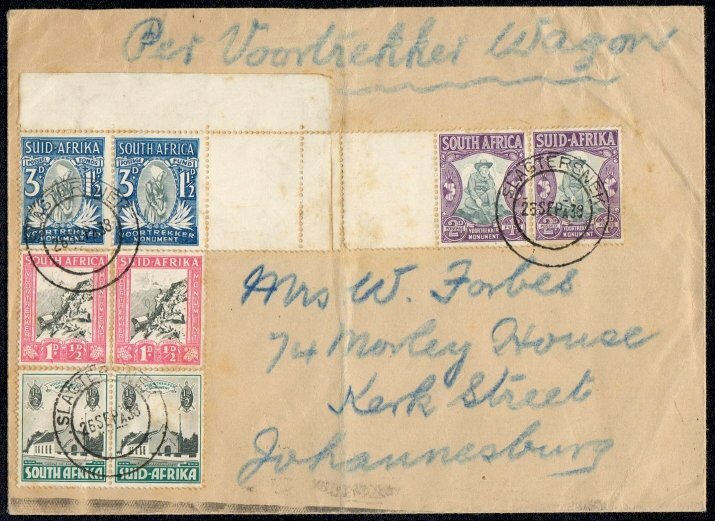 Other than a mention in the August 1938, the Philatelic connections with the Ox wagon journeys plus the various postmarks employed on the commemorative covers received no coverage in The South African Philatelist. Perhaps that was due to the bad image commemoratives had been subjected to in the general philatelic press, thus to avoid getting egg on their face the S.A.P. played down the entire re-enactment as much as possible. It took until 1975 for Hasso Reisener to do some justice to the philatelic events of 1938 in his book The Special and Commemorative Postmarks, Cachets and Covers of South Africa by devoting more than six pages to the famous Trek. It has been recognized, that his information was probably gleaned from official sources as there are inaccuracies in his resume. Our member Siegfried Mayr in the USA is a Great Trek enthusiast and advises us that a more authoritative text which covers the history and the details of the 1938 trek is - G.D.J. 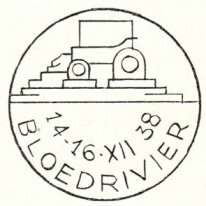 Duvenhage Die Gedenktrek van 1938: 'n Bedevaart en 'n Kruistog published in 1988 by Gutenberg in Pretoria. The title translates The Commemorative Trek of 1938 - a Pilgrimage and a Crusade. which often vary from those listed in Otto Reisener's book. He is also aware of one cover (Port Elizabeth) which H.J. Klopper refused to allow on the wagons due to a disagreement with the city mayor. Hence such covers do not have the machine cancel, but are properly dated. I believe to be a unique cover, that was cancelled at every stop on the Trek route. 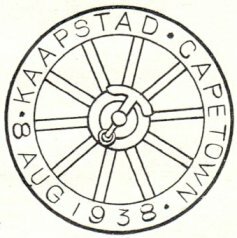 Starting in Cape Town on 8 AUG 1938 and terminating at the Voortrekker Monument on 16 XII 38. There are 48 transit backstamps via Philadelphia 9 AUG 38, reaching VEGKOP 1 NOV 38 to Parys on the 5th and leaving the Orange Free State the cancellations continue on the front of the envelope with the first stop in Transvaal at Potchefstroom, continuing as far Northwest as Zeerust, then heading East – Southeast via Germiston and South to Vereeninging then Northeast via Heidelburg towards Johannesburg and Pretoria and journey’s end at the site of the Voortrekker Monument. The real interest of this Proving cover is that the various transit cancels indicate that the actual journey taken by this ox wagon differs from the itinerary Reisener published in his book, from Cape Town it went North, in the direction of Malmesbury, to Philadelphia and then swung South east towards Stellenbosch and intermediate stops in the Cape such as Breederivier Station, Bonnievale, the delightful little town of Zuurbrak, Albertina and De Rust are not mentioned. Nor are the Orange Free State towns of Wepener, Thaba ‘Nchu, Edenville, Heilbron, Kopjes and Vredefort included by Reisener. The journey in the Transvaal is also quite different & I gain the impression that the ox wagon almost went walk about as it wandered Northwest as far as Zeerust before swinging back south to the Vaal river to the border town of Vereeninging. Again places in the Transvaal such as Vereeninging, Heidelburg, Boksburg North, Boksburg and Alberton do not receive a mention in Reisener. Also the dates on this cover do not agree with those in Reisener book and it ought to be appreciated that the information in Reisener often appears to reflect an intended itinerary rather than the actual journey. I (Otto Peetoom) proved this when I researched the 1925 the Royal Tour by the Prince of Wales, Reisener’s train journey was the initial planned route whereas the actual trip deviated in more than one instance with the result that the dates noted by the author do not tally. 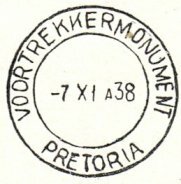 Eleven years later the creator of this cover returned to affix the stamps and cancels to celebrate the 16 DEC 1949 opening of the Voortrekker Monument.